The Zive Z# multichannel impedance monitor is for multichannel application to measure several impedance simultaneously in fuel cell stack or battery pack etc. This can measure impedance spectrum of each cell and system can be expanded by connecting other slaves. Z# multichannel impedance monitor has an independent 6 channel AI(analog input) board. So it can provide real multichannel EIS monitor function synchronized. Some other commercial multichannel impedance monitor use a multiplexer to measure EIS sequentially. This kind of instruments take a long time to measure EIS. EIS measurement is time domain so synchronized measurement is essential. Zive Z# provides all tools for the application of fuel cell, battery, solar cell, super capacitor and general electrochemical study requiring EIS measurement using external electronic load or potentiostat/galvanostat. 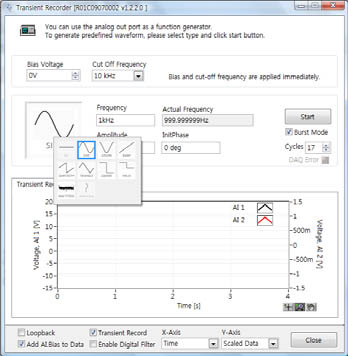 By employing electronic load, Z# can be used to determine the efficiency of fuel cell and anodic/cathodic process mechanism by calculating impedance with the measurements of I and E at given frequency. The complete system is software controlled and all functions such as calibration and measurement is automated. Z# navigator is Z# control software. This can be used with external potentiostat/galvanostat or electronic load by setting for impedance measurement or waveform generator. ZMANTM will be supplied for analysis of Zcon data without license code.